As this green turtle ascended towards the surface to get a breath, it swam really close to me, allowing me to take a portrait. 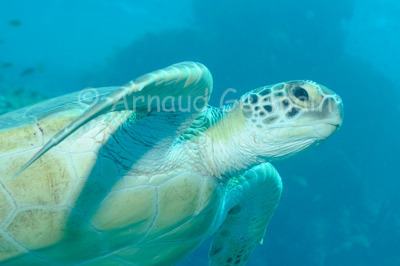 In Marsa Shagra bay, you can encounter two species of turtles regularly: this green turtle and the hawksbill turtle. Nikon D700, Nikon 28-105 mm macro at 70mm, F9, 1/200th, ISO 400, Ikelite Housing and Ikelite DS160 strobe set on TTL. Marsa Shagra North House Reef, about 15 metres down, Marsa Alam, Egypt.